Just like any other place in the world, Beijing and by extension the Great Wall of China has its distinct climatic and weather conditions. For Beijing, this is a temperate and continental climate, comprising of four seasons, characterized by huge temperature variations between day and night. When planning to visit the Great Wall, it would be prudent if you scheduled your trip during a favorable weather condition. From March to May, Beijing experiences spring, where the temperatures alternate between high and low. It is often windy and dusty more so during the occasional sand storms. In summer, between May and August, Beijing is usually hot and humid, with frequent showers. Almost 75 percent of Beijing’s annual precipitation occurs during this period, where the temperatures can rise to 43 degrees. Autumn falls between September to early November, and it is arguably one of the best times to visit the North Wall, since the days are warm, and the nights cooler. During winter, from December to March the weather is dry, cold and long. Occasionally it snows, causing the temperatures in areas towards the North of the Great Wall like Inner Mongolia, to fall below freezing point. Although the dry and icy weather will be harsh on your skin, the many snow-capped mountains are a magnificent sight to behold. Despite all these weather variations, you can visit the Great Wall any time of the year and still have a memorable experience. You only need to plan the trip to suit the prevailing weather. 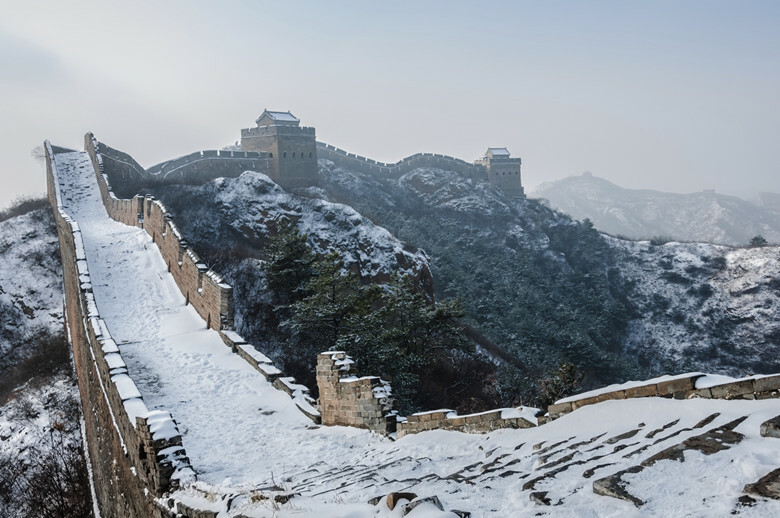 If you visit the Great Wall in winter, you will likely see plenty of snow like snow-capped mountains. However, watch out for the treacherous and slippery icy terrain. Wisdom and common sense would prove quite useful in determining where to walk. Put on suitable winter gear and equipment to prevent hypothermia and heed to the weather forecasts announcements. A heavy snow forecast, for instance, means the snow has a thickness of up to six inches. So much snow can reduce visibility, and also cover the paths, making the terrain highly dangerous. 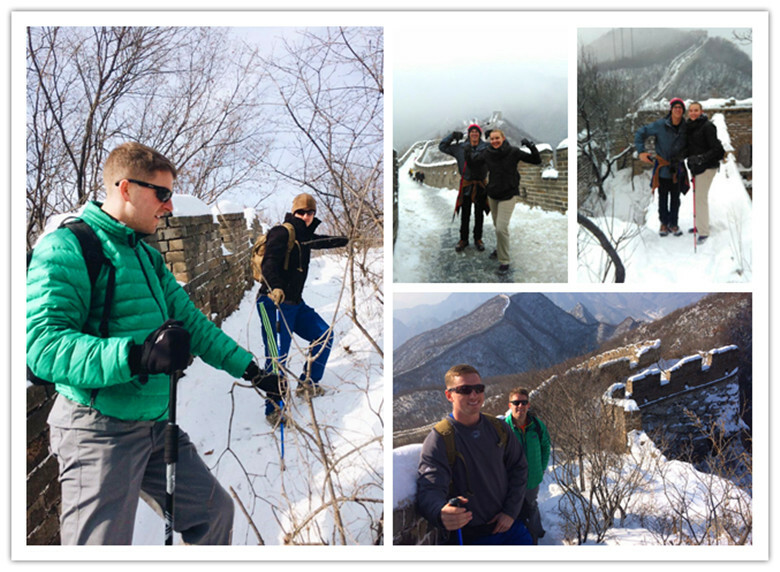 If forecast warns of blizzards, do not attempt hiking the Great Wall. The slippery ground and the near zero visibility challenges and disorients even the most experienced hikers. Winter and spring are the windiest seasons, where the storm can blow from 50 mph to 70 mph. If the terrain consists of ridges and exposed paths, the dusty wind will make hiking uncomfortable, problematic and risky. A powerful storm can even blow someone over the ridge. If you intend to ascend the highest peak of the Great wall during any of these periods, first bring along wind resistant gear, and make sure you carefully listen to the weather forecasts. 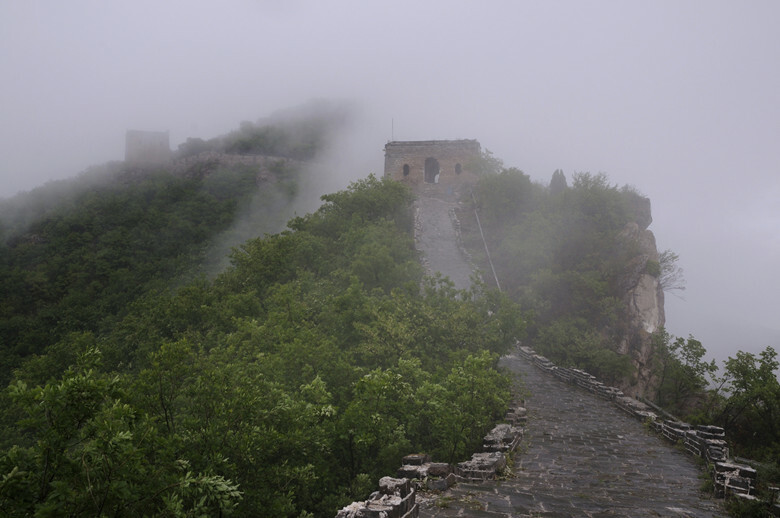 If you walk along the highest peaks of the Great Wall, you are highly likely to encounter fog, irrespective of the season or time of year. Fog is, however, quite prevalent between the months of January to June, and from November to December. Fog reduces visibility and increases disorientation. It further makes it difficult to see the surrounding or find the right path. When you hear a fog forecast, just reschedule your walk to another day. However, if the fog comes down while you are on the wall, do not panic. Just take the most sensible option. In case you are near the highest sections of the wall, and the fog only conceals the summit, it is safe to proceed. However, if you are in the lower sections of the wall and a thick fog looms overhead, your safest move is to turn around and go back. 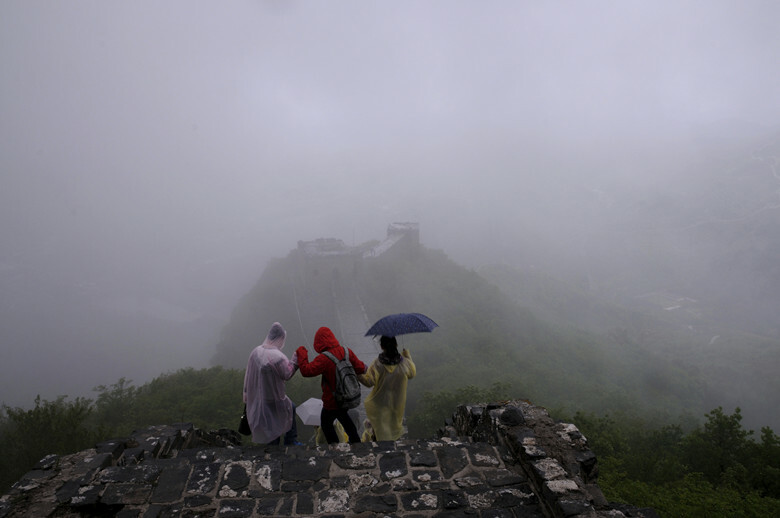 You are likely to experience plenty of rainfall if you visit the Great Wall in summer, between early June and mid-September. Despite the torrential rain, the weather gets extremely hot. About 30 to 40 degrees Celsius making it ideal to wear light clothes. Even on seemingly sunny days, short and heavy rainstorms can come unpredictably. It is here that listening to weather forecasts reward generously. Imagine being caught up in a thunderstorm while at the top of exposed summits and ridges. The rains will make you wet, bog your visit, decrease visibility and make the terrain muddy. There is no much variation between the weather in Jiankou, Mutianyu and that of Beijing. In winter, it gets icy and dry even when it is sunny. January and February are often the coldest, with average temperatures ranging between -5 and -12. The howling Siberian winds also do not make life at the Wall any easier. These sections of the Great Wall experience snow in December, and occasionally in January. The weather in these Great Wall sections are highly unpredictable, and they change unexpectedly. During winter, the walls get icy in winter especially when it is windy and clouded. In early spring, however, the walls experience constant haze and storms. If you intend to visit the Jinshanling and Simatai Great walls, Spring and Autumn are the best seasons to do so. Before you start your walk check the Jinshanling Weather Forecast – if high winds, heavy rain/snow or high wind is predicted then better walk in another day.